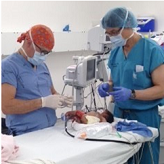 In February 2015, Sales representative Matthew Marks and Dr. Jonathan Riley lead a NuVasive Spine Foundation supported mission to Mirebalais National Hospital in Haiti. Over the course of a five days, the team performed eight successful spine surgeries. Can you give us some background on the Haiti Program and how it came together? Matthew: This trip came to be through Dr. Riley, who is one of our chief neurosurgery residents at the Emory Neurosurgery Department in Atlanta, GA. Dr. Riley has been doing mission work in Haiti with the organization “Partners in Health” (PIH) for almost three and a half years. 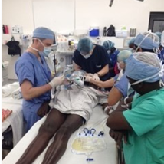 Through his mission work, he has seen that there is a clinical need for spine surgery in Haiti but they just didn’t have the instrumentation nor the expertise to do it. The model we are working towards is to have the Emory Neurosurgery Department partner with three other academic institutions to create a rotating service at Mirebalais National Hospital so that we will always have a neurosurgery resident and an attending on-site, at least one week out of the month, to perform pre-scheduled operations. 1) It’s in a relatively rural area and this gets away from crime and the things that come from being in a large city. 2) It’s geographically near the center of the catch-net area for a dozen or so community health centers that PIH has around the country. This hospital sees high patient traffic because of its referral pattern from these health centers. 3) Mirebalais was thoughtfully designed by PIH to be extremely self-sustainable. The building produces its own electricity and recycles its grey water. It has a lot of the ingredients necessary for a very good facility– one that’s safe and has the patient population to necessitate this program. What do you feel was the biggest success of the trip? Matthew: The team mentality was pretty awesome. Everyone knew their role. We worked until 1:00 a.m. three of the five days, and not one person complained. On Friday, we were able to do three cases in a day which is a testament to the trainability of the staff and their eagerness to learn. Doing three spine cases in a day in Haiti is unbelievable. Tell us about one of your most impactful cases. It was unbelievable to see the strength of that 17-year-old boy considering the amount of pain he was in. He didn’t want to complain; he just wanted to know what side he could lay on. It really made me feel like we were making a difference. We did one unplanned surgery on an infant with Spinabiffeda. Spinabiffeda is a condition where a baby is born underdeveloped and the spinal cord is actually outside of the body. If our surgeons hadn’t been there, this baby would have died. 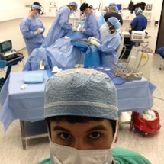 Dr. Boulis and Dr. Riley were able to make incisions and tuck the spinal cord back into the baby’s body. You had to have an experienced neurosurgeon to do that. Being able to intubate that baby, keep him asleep for that long and perform the surgery with the limited resources available to us was amazing. It was a fascinating case. The last time we rounded on the baby, the baby was doing well, moving all extremities and the wound was healing nicely. What can you tell us about the projected sustainability of this partnership? Dr. Riley: There are two parts to that answer. From an educational perspective, it is a long-term goal to empower the local surgeons to be autonomous, in terms of their own education. We would like to create training programs so that people can train, graduate, and ultimately train the next generation. To be complete, we also have to consider support in terms of instrumentation. It is necessary that hospitals come to recognize the need to move toward a model of shared responsibility, in order for this to be a feasible long term program. I think it is not a stretch to assume that hospitals will realize the cost savings of being able to instrument patients and send them home, presuming they are offered a pricing structure that is within their constraints. This is a hospital run entirely on donations, albeit very successfully. How did this trip change how you think about yourself or your life? Matthew: I try to be a thankful person, but seeing what these people deal with on a daily basis, being thankful really stuck with me.